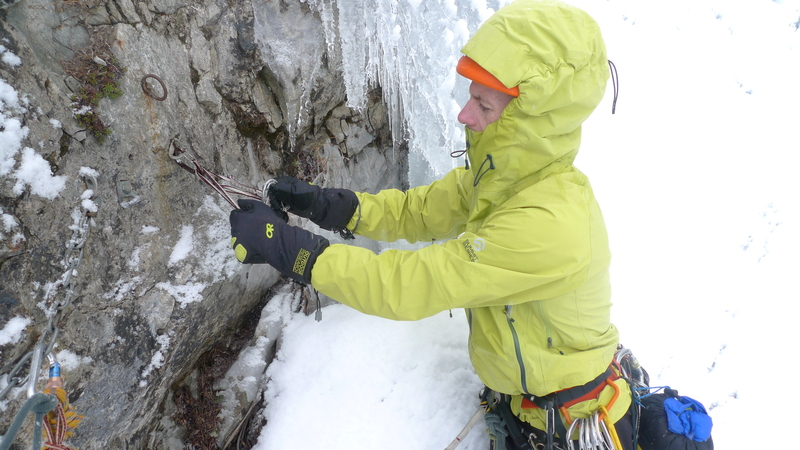 Testing the dexterity of the Outdoor Research Alpine Alibi II Glove on a cold day ice climbing in France. I generally demand a lot from a pair of gloves. I get cold hands (and feet) due to poor circulation and need a glove that is going to be warm, but dexterous enough for hard climbing. I also need them to last more than a season. They need to be tough! Granted, I can not usually get all these things from just one glove. I normally carry 3 or 4 pairs on a day out winter climbing in Scotland, a warm gauntlet style for belaying, and a couple of thinner, short cuff, soft shell pairs for climbing technical pitches; feeling that it’s best to put up with a bit of extra cold for an increase in dexterity and a decrease in scare factor and pump. So, where do the Alpine Alibi II Gloves from Outdoor Research fit in to all this? Well first of all, they are a full gauntlet style, lined with a Gore Tex membrane and insulated with Primaloft One (synthetic filling). 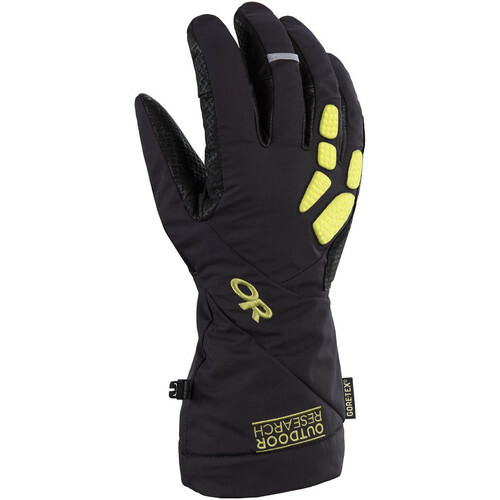 This means you get great hand protection from the elements and they are warm. With 170g of Primaloft One insulation, Outdoor Research say these gloves have a target comfort range from -5°F to 20°F. And they really are warm! Probably a little too warm for strenuous pitches in Scotland but perfect as a belay glove or if you want to give your hands a boost when moving more slowly. I used these gloves on quite a few damp (wet!) 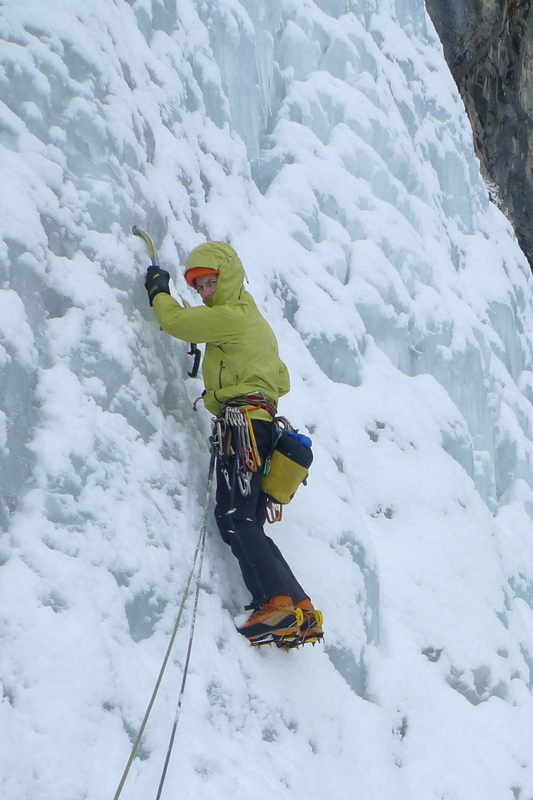 days in the Scottish mountains this season and the Gore Tex liners did keep my hands dry. What I did notice however, was that the stretch softshell outer fabric wetted out completely on a couple of occasions. These were pretty wet days but I could ring them out by the time I got back to the car, they were that saturated! Astonishingly, my hands were still fairly dry inside though! I have used these gloves for climbing technical mixed pitches on Ben Nevis, ice falls in the Alps, winter mountaineering in temperatures down to -15 degrees C and also whilst skiing. They worked for all of these applications but probably performed best for me on winter Alpine climbs and ice falls of medium technical difficulty. The Outdoor Research Alpine Alibi II Glove was dexterous enough for placing protection on steep ice climbs and protected my hands from the elements. The dexterity of the Alpine Alibi II Gloves is very good for a glove of this warmth, but I did have a slight issue with the fit. I wear a size small in these (for comparison purposes I wear a medium in other brands such as Black Diamond) and whilst the fit and dexterity of the fingers was superb, the thumb was way too big for me and had the knock on effect of making the glove feel clumsy in those situations where lots of dexterity is needed, such as fiddling gear in and clipping on tricky cruxes! They may be fine for you, so you just need to try them on before you buy them! So far the quality and durability is proving to be brilliant. The Pittards leather palm and fingers are showing very little wear. I really like the foam panels on the back of the hand for protection when using ice tools, however one thing I am noticing is that the edges of the fabric they are set into, are showing wear and this could maybe have been done more neatly. This is the only major sign of wear so far though. Other features I like on these gloves are the internal gusset and SuperCinch gauntlet closure which do a nice job of sealing out the elements. The Idiot Cords are also great too and a good backup to stop the clumsy ones amongst us, dropping them 1000m down an icy North face! So to conclude, the Alpine Alibi II Glove from OR is a well made, warm and protective gauntlet, great for winter Alpine climbing, Scottish routes as well as skiing and general mountaineering. The fingers are dexterous for a glove of this warmth rating although I did find the thumbs too long for me. Find out more and buy these at the Outdoor Research website.